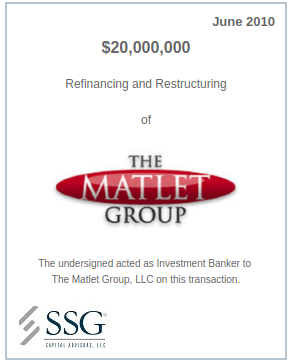 The Matlet Group, LLC (‘Matlet’ or the ‘Company’), headquartered in Pawtucket, RI, is a premier printing company serving the commercial printing and fulfillment markets. Acquired from Quebecor in 2005, Matlet is a Minority Business Enterprise that offers a diverse product line that includes high-end commercial printing (specialty catalogs, brochures and inserts), specialty products (restaurant menus and playing cards), specialty packaging (blister packs, folding cartons and clamshells) and full service fulfillment/mailing services. Matlet operates through three subsidiaries: Central Florida Press (a menu printing business servicing the restaurant industry), Packaging Graphics (a manufacturer of point-of purchase packaging materials for consumer goods) and NOVA Marketing Services (a full service fulfillment company). The Company’s breadth of product offering, as well as its reputation for delivering high quality and custom made solutions, has allowed it to become the supplier of choice for blue-chip customers that operate in a wide range of industries. The recession had a negative impact on the commercial printing and fulfillment industries with overall budget reductions across Matlet’s client base. Given the resultant impact on profitability along with debt levels that remained from the management led buyout in FY 2005 and a refinancing that occurred under better economic conditions in FY 2007, the Company sought a means to reduce leverage and strengthen its balance sheet. SSG lined up a new lender, Cole Taylor Business Credit, to provide a revolver and term loan facility that enabled the Company to repay senior debt. SSG, working closely with company management and other professionals, helped facilitate negotiations amongst key stakeholders that further enabled the company to successfully restructure its remaining debt and equity.